I am so grateful for the mercy and grace God has given us who believe in and choose to follow His Son. We are blessed! When Christ died on the cross for each of us, He died willingly. When we turn to Him and confess our sins, acknowledge Him as Lord and follow Him, we inherit all the blessings of the children of God. It took me so many years to finally understand that works will never make me more like Christ. I must believe that the work He did on my behalf on the cross was complete. Trusting in Him and allowing Him to now work through me through the power of the Holy Spirit is the way I choose to live my life. I don’t ever want to forget the wonderful mercy and grace that has been extended to me and to everyone that chooses Christ as Savior and Lord. I know longer have to strive to feel accepted. I am accepted. Knowing who we are and what we have inherited as children of God should give us the heart and confidence to extend the good news to others. It should also cause us to want to reach out and demonstrate His love to those in our lives and those He brings into our lives. So how do we do this without stumbling ourselves? How do we keep moving forward in our walk? 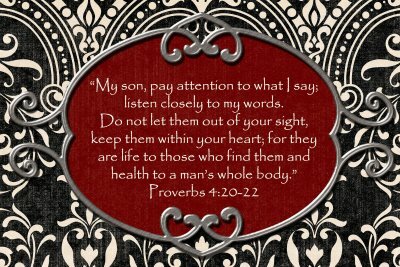 As I make my way through the book of Proverbs I see so many awesome words of wisdom to help us in our walk with Christ. Today I want to focus on Proverbs chapter 4 verses 18-27. There are so many encouraging words found in this Proverb to help us victoriously live as followers of Christ. Lord, help us to always remember that we are to bring Your light to a dying world. Help us to demonstrate that light by living in close communion with You today. Help us to keep our hearts and lives free of the snares of sin by keeping our gaze fixed on You Jesus. We love you Lord and desire to keep moving forward until we see You face to face!